WARNING: "Casinos Actually Promote Sucker Blackjack Systems Like Card Counting!" That’s right, because they know that most people can’t memorize cards or keep counts under pressure, and the few who can are blacklisted in no time. So why does the industry promote it? My name is Bill, I was a school teacher and was once like you. I bought into the theory that the game could be beaten by counting cards. And BELIEVE ME, I ate, drank and slept blackjack for over five years. You name it, I mastered it: Hi-Lo, Hi-Opt I & II, K-O, Zen Count, Canfield Expert, and more. I spent hours on card counting forums and blackjack discussion groups, and I found that people only bragged about winnings, but never mentioned their losses. Why couldn’t I win? I was so frustrated, as I couldn’t understand how all the popular literature and so many websites were dedicated to the subject of card counting, but no one I knew could win consistently using these strategies. Sure, I had some big winning days when I celebrated and took my friends out for a night on the town, but my losers always ate away at my profits and eventually put me back under water. I used to spend hours at a table amassing a pretty good stack of chips only to be WIPED OUT by a few bad hands. I was even BANNED from more than one casino after simply being told that they didn’t like my “STYLE OF PLAY” and was no longer welcome. I went from one card counting strategy to another, learning to camouflage my betting pattern and changing tables often, but at the end of the year, I was always at a NET LOSS. The pain was so deep, I often felt like the unluckiest guy in the world. 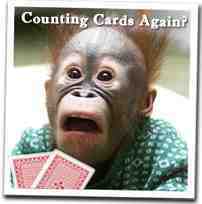 Yes, it’s THAT painful – so I definitely know how you feel if you’ve been counting cards. You see, what the industry won’t tell you is Vegas’s dirty little secret that casino operators love and even spread the myth that the average Joe can win consistently by counting cards. 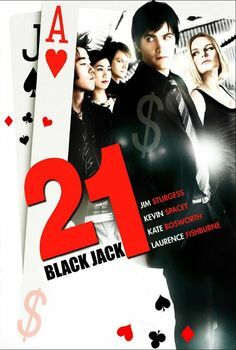 Hollywood movies like “21” and “The Hangover” and novels like Bringing Down the House draw public interest in blackjack and card counting. The media entice us to flock to the casinos to emulate our silver screen heroes. Most of us experience some early success (usually pure luck), but later we give it all back and then some. And then we end up withdrawing more cash from the ATM machine to chase our losses. Do you think casinos are upset when the Travel Channel shows an endless cycle of stories about card-counting blackjack teams who took on Vegas and WON? Not at all. In fact, they love that kind of free publicity. See, for every professional blackjack team grinding out tiny advantages, there are thousands of amateurs counting cards and doing it poorly; LOSING, while trying to prove to the world how smart they are. And the pros, who are doing it right, have been blacklisted and can’t even play! So, what’s so bad about counting anyway? Well, let’s start with the math. The authors of these systems expect you, not only to memorize a value given to each card (the index number), but to keep a running count and convert that number to a true count of the sum of the cards being dealt, to be able to estimate and divide that index number by the remaining cards or decks in the shoe, and to know when and how to play a deviation from basic strategy. Also, you’re required to play at a certain position at the table and to camouflage your betting spread so as to avoid the heat (unwanted attention from the pit bosses). Oh yeah, and if you lose track of JUST ONE CARD on the table, the entire system may COLLAPSE and you may RISK LOSING your entire bankroll by staying in the game. Add adrenaline, alcohol and the noise of bells, laughter and shouting and you have a recipe for concentration breakdown and DISASTROUS losses. You get the idea. 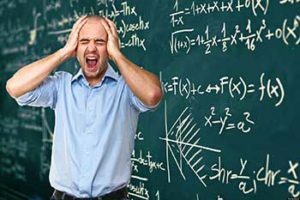 You pretty much have to be a rocket scientist or math whiz to be able to use these strategies and maintain your sanity. All those mental gymnastics under intense pressure for a mere 2% advantage over the house at most! Ask yourself, is it worth it? And then there’s all that waiting around. Besides the math, you could spend hours WAITING for a deck to turn rich in high value cards (that may or may not happen) because the casinos are taking countermeasures to STOP you. Not only are they limiting the penetration of the deck by controlling the reshuffle point with the cut card, now they’re restricting betting spreads, multiple hands, mid-game entries, and using continuous shuffle machines to stop card counters. The pit bosses and the people watching the surveillance cameras are there to track your betting patterns. … it’s considered cheating by all casinos and it could get you banned for life! Think you can play undetected? THINK AGAIN! Transceivers in the playing chips now allow them to monitor your betting spreads, and facial recognition technology keeps undesirables in their databases from entering the casino, with or without a disguise. Besides, do you really want to play undercover like agent 007 just to be able to play a decent game of blackjack? So you see, you really can’t count on counting as a viable strategy in the modern casino environment. Unfortunately, no. See, most of these basic strategy progression systems differ only in their money management technique, that is, how you vary your bets. They all rely on the same basic strategy chart and this is their first flaw. There’s NO such thing as a single universal basic strategy chart for all blackjack games. Basic strategy (the statistically best way to play a hand) varies from game to game depending on the number of decks and the rules offered. But they tell you to memorize the chart for the most common 6 deck game. If you apply their basic strategy to any variation of the rules or the number of decks, it’s wrong, and you’ll lose in the long run. The other problem with these systems is that they treat each hand as an independent event and simply try to maximize your odds for that particular hand. They DO NOT account for streaks of winning hands, the key to catapulting your bankroll. 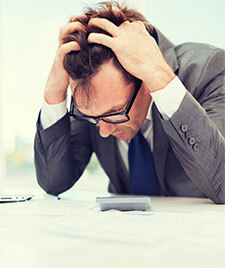 Even strategies that claim to take advantage of winning streaks are NOT OPTIMIZED to maximize this profit and do NOTHING to curb your losses when the dealer is experiencing a lucky streak of his own. Essentially, these dumb systems involve nothing more than an oversimplified faulty basic strategy and a money management technique that leave the player with LESS THAN a 50% chance of winning. If that were all we wanted from a blackjack system we might as well flat bet on a coin toss. We could sit there all day and make or lose a few bucks. As a school teacher, I had very little patience when it comes to systems like these. I was looking for that edge that would put the odds in my favor, and the MONEY in my pocket. What if I told you there was an easier way to beat the dealer? One that didn’t involve heavy math or memorizing cards? In fact, a method so easy that a child could learn it? I know it sounds too good to be true, and I didn’t believe it at first either, but after using it over and over to make BIG WINNINGS in casinos on land and online, I can’t deny it simply WORKS! 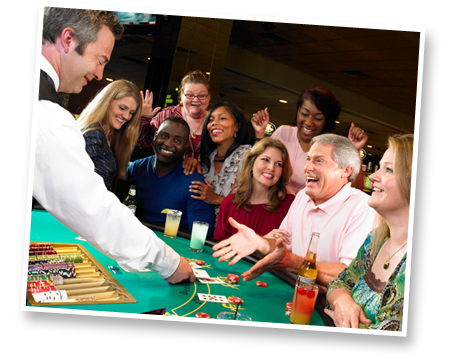 Studies show that about 80% of the time, blackjack games are choppy. This means the dealer and the player alternate winning and losing hands. This assumes you use correct basic strategy (you know, the chart that tells you when to hit, stand, double-down, or split). By using optimal moves and playing in games with the best rules, you can turn the casino edge against you from 7 to 8 percent down to LESS THAN 1 percent. But in the long run, even if you play with correct basic strategy in the most favorable games, the house STILL WINS with an advantage of about one percent because the player ALWAYS RISKS BUSTING before the dealer. That’s a big advantage for the dealer and there’s NOTHING we can really do about that, except try to PREDICT when he has a higher chance of BUSTING. And even though card counting systems can raise the odds in your favor by as much as 2 percent, that usually happens under heavy deck penetration, when most of the cards have been dealt (they usually reshuffle before this). Counting remains a big WASTE OF TIME against most blackjack games because the “rich deck” (when you’re supposed to raise your betting spread) RARELY materializes. In a game that can be played with very close to 50-50 odds, like blackjack, the real way to WIN is by catching streaks, which occur in EVERY GAME! 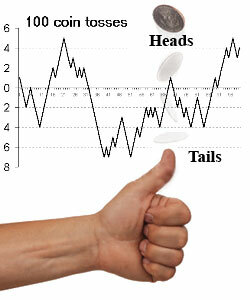 If you flip a coin several times you’ll find that heads comes up about 50% and tails comes up about 50%. But notice, if you flip a coin long enough, you’ll come across a streak: heads or tails will turn up several times in a row. Although the number of times one side will come up in the long run is 50%, it won’t always come up in even intervals (heads, tails, heads, tails, etc). Streaks are phenomena that occur in almost EVERY aspect of our lives, yet they remain mostly unexplained. When you play a perfect basic strategy, it’s almost like flipping a coin. You and the dealer take turns winning and losing hands against each other. But sooner or later you’ll win several hands in a row. Streaks happen in blackjack just like in tossing a coin. So, how do you maximize your profit during these situations, you ask? One night, I was lying in bed practicing my basic strategy and card counting, when it came to me… I found a way to EXPLOIT these STREAKS when they occur to MAXIMIZE returns. I saw the solution to blackjack, and at its core was the radical approach of altering both the bet amount and the basic strategy during streaks. The secret is not only in the betting sequence, but in the little known modifications to the basic strategy that casinos are POWERLESS against. These modifications change slightly depending on the rules and the type of streak the player is encountering. You see, just like the player can experience a streak of winning hands, so can the dealer. So my system also uses an innovative money management technique which allows you to OPTIMIZE RETURNS for dealers’ streaks as well, as you COMPOUND your winnings. I quickly jotted down some notes and got to work on calculating the odds of winning in different scenarios. I tested an early prototype and it worked great at exploiting streaks of several winning or losing hands in a row. This was confirmed after running it on a blackjack simulator. I initially made a few thousand playing in the casinos. I was so excited that I shared it with my closest friends who also made easy money in Vegas, Asia and in the Caribbean. But after playing for many months, it became clear that these streaks were NOT always present. I needed to beat the game during choppy sessions, when the dealer and the player go back and forth winning and losing every other hand. That’s the time most card counters are sitting it out or flat betting the table minimum with little or NO RETURNS. I teamed up with an old mathematician friend of mine, and together we went to work on solving the puzzle of how to profit during a choppy game. After many months of experimenting with combining the strengths of various blackjack systems and adding some completely revolutionary techniques, we eventually tweaked out all of the kinks and MAXIMIZE the PROFIT POTENTIAL in every game. We could beat the dealer during streaks and choppy games too! It became clear that we had cracked the code to winning consistently at blackjack! I could barely contain myself when we tested it on the top blackjack software and it WON OVER AND OVER again! Then we took it to the casinos and really cleaned up! On one trip, a close friend of mine played in the casinos for one week straight, stopping ONLY to eat and sleep. He netted over 150k! Then we went online and made sure to play at only reputable sites and continued to rake in HUGE PROFITS. Sure, we lost some hands, but we came out ahead consistently, making huge profits, and that was the key. And we did it all WITHOUT counting cards or a team of MIT students. My brainchild, The Easy Money Blackjack System™, is the most CONSISTENTLY PROFITABLE system I’ve seen hands down! I know you’re probably skeptical of systems; I was too. That’s why I had my strategy tested on computer simulations, in online casinos, and in actual casino play. I have spent YEARS developing and perfecting this unique approach to winning consistently at twenty one. I’ve used it OVER AND OVER again to amass huge returns. I did NOT stumble upon this solution by chance. I meticulously searched for a PRACTICAL, PROVEN, and APPLICABLE solution that would end my overwhelming losses once and for all. After years of searching, implementing, and testing, I now have in my hands a PROVEN formula that is guaranteed to beat the dealer consistently. Note: This is NOT some inferior product with a simple hot streak progression. It is a genuine 80 page digital manual with detailed step-by-step instructions on how to beat the game of blackjack. This unique system is NOT found in stores. If you’ve ever played blackjack before, you’ve probably managed to make temporary winnings that later dwindled and left you going into your own pocket in search of more funds. I know; years ago, I was there. But NO LONGER. I’ve learned how to play with their money early on or I leave the table. You can learn this strategy as well in less than a couple of hours! The other day, I was coaching an apprentice at a $10 table. We watched as the others at the table lost their bankrolls as soon as the dealer experienced a lucky streak of winning hands. My student was able to ride out the dealer’s streak using my system, and actually PROFITED by the end of it. Then he experienced a streak of his own, WINNING 8 hands in a row! There was no suspicion of card counting, since all of the cards were being dealt face down. People around him were amazed and even the dealer commented on how LUCKY he was. Little did they know, he was employing the two-fold Easy Money Blackjack strategy the house was POWERLESS against. He walked away with several thousand dollars that session! 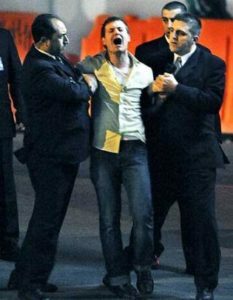 Suffice to say, he made a few friends that night. What’s so much better about the Easy Money Blackjack System™? You DON’T need a huge bankroll (you can play according to your funds). You can start by making small bets and end up playing for large stakes, risking ONLY your winnings. 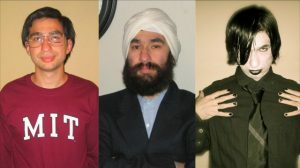 Also, there is NO need to disguise your betting patterns. You can play RELAXED since you DON’T have to WORRY about pit bosses banning you from the casino for counting cards. There are ONLY a few rules to follow in this system so you don’t have to wear yourself out by concentrating on highly complex systems, such as card counting. 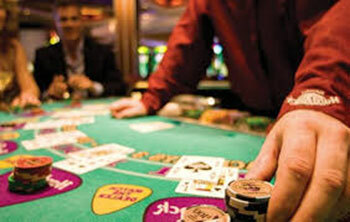 You can play at most popular land based and online casinos in games using any number of decks (even those that use continuous shuffle machines). Best of all, this system OPTIMIZES returns for both winning and losing streaks (An innovation truly unique to our system). Practice and hone your skills, much like an athlete. Set a win goal and loss limit for your bankroll. Play uninfluenced by emotions of fear or excitement. Know when to keep raising your bets and when to cut losses and leave. You’ll know all these essentials using a simple training program before you go near a dealer. And once mastered, The Easy Money Blackjack System™ will make you an UNSTOPPABLE force at the table! I will show you how to spot the HOT tables and how to avoid the COLD ones! You’ll be able to track several tables and identify the one where the streak is most likely to occur in your favor. That way you’ll have the ADVANTAGE before you even sit down to play! Among many techniques, you’ll also discover how to lock up guaranteed profits using a unique and highly effective money management system that will allow you to walk away from those tables a consistent WINNER. This powerful part of the system can be mastered in UNDER 30 minutes! This is no ordinary blackjack strategy. It’s the FASTEST, consistently PROFITABLE system ever invented and it’s taking casinos by storm. Once you learn to PROFIT from streaks that occur in almost every game, you’ll wonder how you could have ever played any other way. It’s such a radically new approach, that they can’t figure out who’s using it or how to devise countermeasures against it! The potential PROFITS at your first table alone may pay for this valuable information MANY TIMES OVER! But you don’t have to take my word for it. Test out the system on the various blackjack simulation programs available before you take on the casinos. Practice at home with your own deck of cards or on our free online blackjack game. It’s now PERFECT. I have spent years developing and perfecting this unique approach to WINNING consistently at 21 by combining and adapting other systems, analyzing players in play, and comparing methods for hourly winnings and losses. My obsession has finally PAID OFF in a big way! 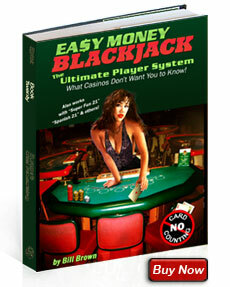 In addition to the Easy Money Blackjack System™, this manual is JAM-PACKED with useful information that you should know before ever stepping foot in a casino. It includes information on everything from how to avoid casino “heat” (generated when your winnings draw unwarranted attention), to when to RUN for the door when the dealer gets HOT himself. protect your bankroll and lock up GUARANTEED profit. stack as many odds as possible in your favor and take full ADVANTAGE of liberal rules. go for the dealer’s throat when he is weak. recognize and avoid secretly devised CASINO PLOYS to part you from your money. What Casinos Don’t Want You to Know. Insidious Tricks and Traps Exposed! Did you know that some casinos pump oxygen into the air to keep you playing longer? Also, intoxicated players lose three times as often as sober players (Are those drinks really free?). Ever notice there never seems to be a clock or a window to the outside in the casino? They want you to lose track of time so you’ll play past your optimal attention span and make small mistakes that will eat away at your bankroll. Believe me when I say they have studied every aspect of the playing field and have made sure to take every legal advantage of you. You’ll discover how to counter their tactics, TURN THE TABLES, and put the odds back in your favor! When should I take insurance? What’s a good table to buy into? How much money should I bring to a given table? When is the best time to cash out my winnings and leave the table? What is surrender, and how can I use it? How are online casinos different than land based ones? All of these questions and many more are answered in this comprehensive guide to beating the dealer. Armed with this knowledge, you will be ONE STEP AHEAD of the game and you will know exactly how to adjust your strategy for many adverse playing conditions. Picture this: While the rest of those so-called card counters are waiting for that deck to turn rich, trying to disguise their betting spread and not get caught, you’ll be playing CAREFREE and having FUN WINNING! Have you ever regretted not betting more on a hot streak? It seems like you can’t stop winning, but you only bet the table minimum because you thought your lucky streak was going to end any second. The Easy Money Blackjack System™ shows you how to adjust your bets to CATAPULT your PROFIT during these streaks! …you DON’T have to wait for a rich deck or even a streak of good hands to see profits! That’s right, it makes steady returns at choppy tables too... when you and the dealer take turns winning and losing hands. Other types of systems like positive progressions, up and pull, and counting systems do NOT profit under these conditions. 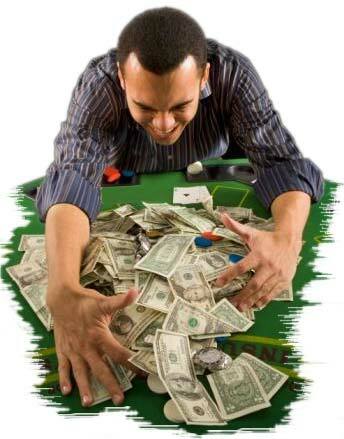 This means that the Easy Money Blackjack System™ MAKES YOU MONEY whether you are on a streak or not. It’s like a chip making machine! 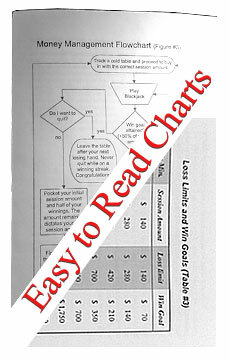 Charts and tables make learning the system EASY. Using a structured methodology, you are less likely to deviate based on emotion or hunches. I show you how to POCKET WINNINGS and start playing with the house money as soon as you meet your win goal. Video tutorials help reinforce the important concepts for visual learners. Once mastered, my unique strategy will let your bets and PROFITS INCREASE while curtailing your losses. I don’t believe that a blackjack strategy should be complex or expensive to work. 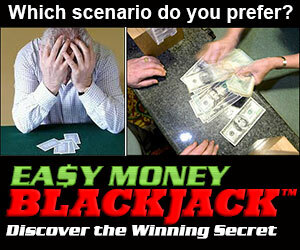 Easy Money Blackjack™ is quite the opposite; SIMPLE to learn and play, yet POWERFUL in its returns! You don’t have to spend a single red cent to see if our blackjack strategy works for you. We have NO doubt that it will, as it has for so many others! That’s how sure I am that you’ll love our rock solid system and that’s why we offer our 60 DAY 100% MONEY BACK GUARANTEE. NO more EXCUSES. With an offer like this, you can’t afford NOT to win. Remember, this is the first time that this breakthrough system is being offered, and it’s turning the blackjack world UPSIDE DOWN. Most casinos DON’T even have a clue that it exists! Sure there are other cheaper, dumbed down systems and imitations out there, but none that allow you to PROFIT under so many conditions with such a HIGH rate of success. In the end, there’s only one Easy Money Blackjack™. Let’s face it. If you play blackjack and you’re NOT winning consistently, something’s NOT right. This is not the way it has to be. You can continue to lose playing by intuition, flawed strategies, gut feelings etc., or you can start reaping profits the easy way. You owe it to yourself to make the change. You’ll be winning hands in no time! So why am I sharing my secret with you? The simple answer is REVENGE! I have seen people make the dumbest plays and the big casinos thrive by giving you unfair odds while allowing you to play in the name of “entertainment.” There is NOTHING fun or entertaining about LOSING money to the house in a rigged game. Recently, many casinos have started paying only 6 to 5 for player blackjacks and some folks I talked to actually believed that it was a better payout than the old 3 to 2! These shady house tactics to increase profits, especially during times of economic recession, really anger me. I see it as nothing less than legal robbery. I have already profited greatly and helped everyone I know, but the truth is that most people play so POORLY, that they might as well write a donation to the casinos every time they go to places like Las Vegas or Macau. I believe that an educated public will only patronize casinos that give players a fair chance and the demand for a clean game will help keep them honest. It’s a win-win for both of us. I give you a GREAT DEAL on the Easy Money Blackjack System™, and in return, you help dissuade casinos from offering unfair rules by only playing in the most advantageous games. The simple laws of supply and demand will force casinos to offer more liberal rules that benefit both you and I. Sure you’ll be able to extract much of the profits from other less fortunate players. But the house will always benefit from the majority of people who use hunches, emotion or inconsistent strategies like counting. Also, when I help you WIN your battle with the dealer, you’re going to tell your family and friends about me and my product. When that happens, of course I enjoy viral word-of-mouth marketing – which means I sell more of my product. All I ask is that when you start winning like so many other happy customers, PLEASE drop us a testimonial and help pass the word along to a friend. Luckily, you don’t have to be a math whiz or a master of memorization to WIN BIG bucks using the Easy Money Blackjack System™. 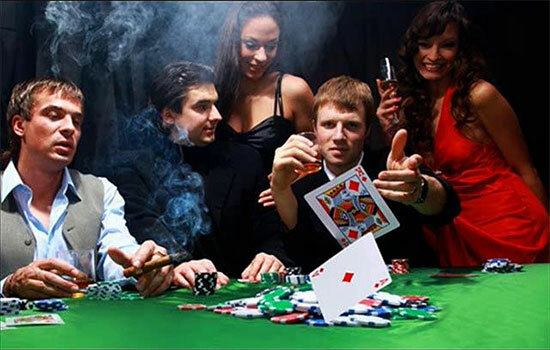 The fact is, you CAN beat the dealer, and I will show you how to do it EASILY! When I show you how to WIN consistently using an UNBEATABLE formula, what will you do with all of your winnings? STOP relying on hunches, luck, or complex counting and learn the revolutionary way to WIN like a PRO. Do yourself a favor and realize your potential today. You won’t believe how EASY WINNING BIG at blackjack can be! A strategy that requires minimal concentration. A simple method to track favorable tables before you play. A system that profits fast, even at cold and neutral tables. Money management that locks up profits & limits losses. Tutorial videos to help you better retain concepts. A proven, easy chip stacking machine! 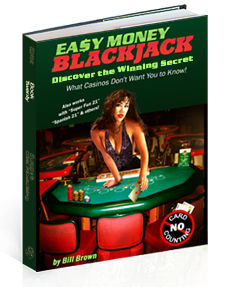 Inside Easy Money Blackjack, you’ll discover PROVEN methods that work (I know because I’ve tried and tested them, remember). I’ve done all of the hard work for you so you won’t have to start from scratch, the way I did. All you have to do is follow a few simple steps in my bullet proof strategy and you can reap the rewards too. Visit the testimonials page to read about what just some of the players have experienced using Easy Money Blackjack. They can’t thank me enough for changing their game. You have NOTHING to lose and EVERYTHING to gain. 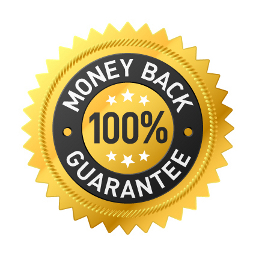 I’m so confident that The Easy Money Blackjack System™ will change your game that I’m offering a “No-Questions-Asked” 100% Money Back Guarantee. All I ask is you try out The Easy Money Blackjack System™ for 60 days and if you haven’t made MANY TIMES the cost of the product in that time, then I DON’T want your money. Simply contact me using our contact link and I’ll happily refund your purchase in full. So to encourage you to take action and purchase The Easy Money Blackjack System™ NOW, I’m going to include some nice related BONUSES that I’ve created myself (NOT from those junk PLR resources) that compliment The Easy Money Blackjack System™ so that you can start winning FASTER. Most others charge hefty fees to access this kind of information, but you will get it FREE. 2″x3.5″ cards that you can use to practice or take with you into the casinos (most people don’t even know that you can do this). That way you can refer to them in case you forget you basic strategy. The statistically correct best play for any given hand. Charts for all the most common 21 games world wide. Color coded to make finding the correct move QUICK and EASY. We link you to the files so you can print them out as often as you wish. Lifetime access to listings of blackjack rules being offered in all of the casinos in Las Vegas, Reno, Atlantic City, Lake Tahoe, Macau, China, and more. 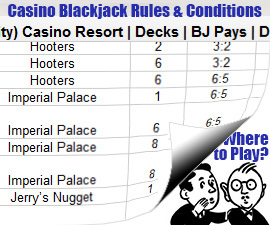 Log in to a current list of blackjack conditions for 2019. The truth is that not all blackjack games are created equal and if you’re not doing your homework and play in the wrong games, you can LOSE YOUR SHIRT no matter what strategy you’re using. 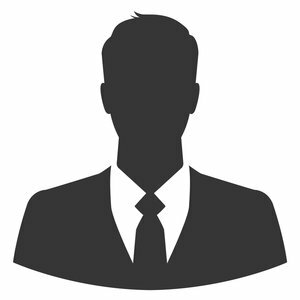 Our listings are constantly updated by our user base. They allow you to easily find the best games with the most liberal rules to give you the edge and avoid casinos that offer lower blackjack payouts and restrictive betting rules. This means MORE WINNINGS and smaller losses for you. Tables may be viewed online or pasted and printed for offline use. Other sites charge $130 subscription fee per year for this service. Printable Pocket Basic Strategy Cards for Use With EMBJ. 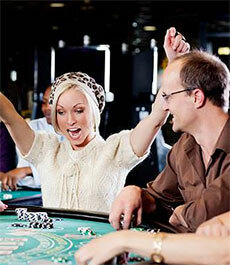 Plus we’ll give you access to online casino reviews, travel and gambling coupons, online blackjack games and more! The value I’m offering you today for my Easy Money Blackjack System™ package along with all the bonuses is really a NO-BRAINER. They could easily cost $1000. But if you purchase today, you ONLY need to come up with less than one-tenth of that price – which I’m sure you’d agree is a STEAL. Only $99 One Time Payment - Instant Access! Instant Download - Even at 2 am PDF ebook viewable on PCs, MAC , iPad, iPhone, Android, Kindle and Nook devices. "I just received (and devoured) your Easy Money Blackjack system... I absolutely love it and it'll be the only way I play blackjack from now on." PS. I truly want you to win so I’m offering it to you right now at this amazing price, and remember, all the risk is on me, and all the benefits are on you. I’m sure you’ll love it as so many have already. But if it turns out that you don’t like Easy Money Blackjack, tell me you’ve honestly read and tried the strategy and it didn’t profit, tell me it was too complicated, tell me it wouldn’t work in your casino, tell me you couldn’t understand how easy it is to play. Simply contact me on my contact page within 60 days and I’ll promptly refund you in full. You pay ONLY if you absolutely love it; I DON’T want any unhappy customers. HURRY, demand has been massive and with our planned affiliate programs, the price of our breakthrough system can increase significantly at any time. After that, come back and click here to learn how I went from school teacher to blackjack pro.